Gah! The fonts, they burn! And the diatomaceous seed-pod ship and the horrible heraldic-icon art, and Isaac Asimov’s face gazing out over all. Yow. 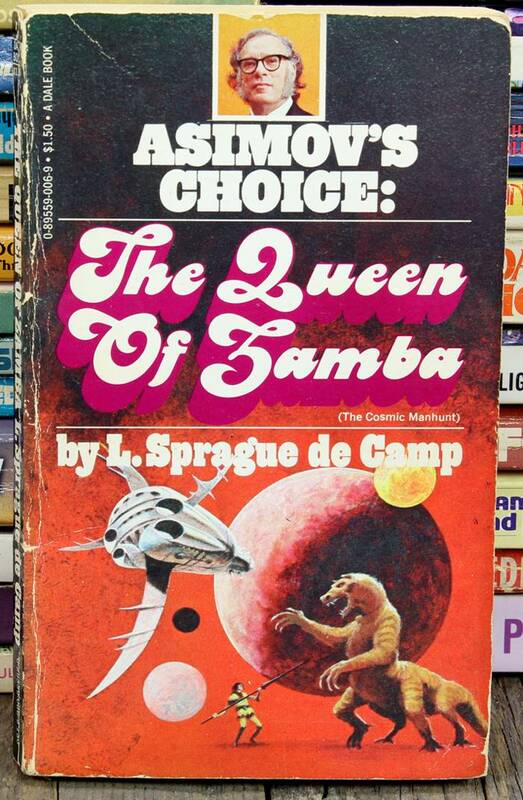 I think Asimov’s choice was not to be on that cover over that horrid font. Look out space monster! He’s about to burst your giant ball! I think the little dude with the spear has bigger problems than that six-legged mongoose he’s fending off. First of all, he appears to be in outer space. Second problem, there’s a space-ship about to crash into him. And third and most important, his mutton-chopped boss has started calling him “The Queen of Samba” behind his back. She defied the code of space! Awesome in all its queenly awesomeness! @Fred – The code of space? Is that like the Highway Code? Or the Countryside Code? For those (like myself) who did not get fred’s comment the first time (or the second, or the third as a matter of fact): if you really close attention to this cover, you might find out that the Zueen of Famba and the Cosmic Manhunt are most probably the same book. @fred: Aww, L. Sprague de Camp got some really tragic covers. Asimov’s Choice, like Sophie’s Choice but with far more logic. Cracking sideburns on Asimov though. I think it might have been over at Librarything that I saw someone use the oath “By Asimov’s sideburns.” Makes me chuckle every time. “The Cosmic Manhunt” is printed in really tiny type right above “Camp” on the cover of [The Queen of &Prince;amba]. Isaac Asimov is distracting you from the fact you already bought this book. The cover of [The Cosmic Manhunt], so titled, makes it pretty clear who’s hunting for a man. There’s one here, lady, waving. Possibly a mistake. I think it’s quite likely that Isaac Asimov preferred the cover of [The Cosmic Manhunt], too, except that we had to go looking for it. You mean there was a worse suggestion? At first glance, no joke, I thought the title was “The Queer of Samba”. That is a really, REALLY Bad font. @hestia: Adding a Hunger Games-esque twist to any of the current dance contest shows could only improve them. Markedly.